The statistics website SignificanceMagazine is a good read. It applies mathematical analysis to diverse real life situations from Valentine’s Day spending, skydiving and chill strength through to a paper on whether walnuts can help with jetlag. The idea of red-shirted characters being frequently killed in Star Trek: The Original Series has become a pop culture cliché. But is wearing a redshirt in Star Trek as hazardous as it is thought to be? To find out, casualty figures for the Starship Enterprise were compiled using the casualty list provided by Memory Alpha. Command and helm 9 Includes Lee Kelso and Gary Mitchell who wore the old style chartreuse command and helm uniform. Also includes O’Neil, whose uniform was not listed, but can be observed in the episode The Galileo Seven. n/a 15 Includes nine killed by the galactic barrier in Where no “Man has Gone Before”, three Rigelian fever victims from Requiem for Methuselah and one unknown casualty of the dikironium cloud creature in Obsession. Also includes Sam and Barnhart who were not in standard uniforms when they died. 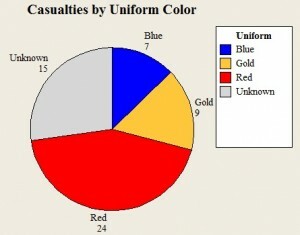 Table 1: Enterprise NCC 1701 casualties from episodes aired between September 8, 1966 and June 03, 1969 based on casualty figures from Memory Alpha. Note: Table does not contain casualties from the Mirror Universe or anybody killed and resurrected during an episode. The whole thing concludes with utter mathematical precision that red uniform shirts are safe, as long as the wearer is not in the security department. Take a look at the website for conclusive evidence that some statisticians need to get out more and either get a girlfriend, pay for one or inflate one.